Please select the your name and contact details below. Make sure the e-mail address is correct for the registration process to complete sucessfully. Make sure the e-mail address is correct for the registration process to complete sucessfully. Please use the same e-mail address for registration and abstract submission. Please select the registrant type below. The regular conference fee apply to General registrants. Student registrants will be required to submit a letter from the department chair indicating that they are currently enrolled and therefore qualify for the reduced registration rate. Registration fees are waived for Invited speakers , Tutorial speakers (1 per Tutorial), or Members of the press, but a registration is required for administrative purposes. Please select your registration type below. Registration fees cover the participation to the conference, proceedings, welcome reception and three lunches at the conference site. 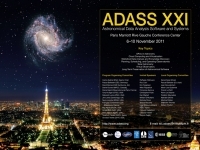 A Conference Banquet will be organised on Tuesday 8 November 2011 in the restaurant La Coupole. The banquet fee is 60 €. Please remember that it is important to book rooms at the conference venue for a balanced conference budget. This information is for planning purpose only and does not affect the registration fee. Please indicate below whether you intend to give a presentation at the conference. This information is for planning purpose only and does not affect the registration fee. Did you check your input? You will now be transfered to the Web site of Paris Observatory. You will have in the next page the possibility to check your data again before proceeding to payment.